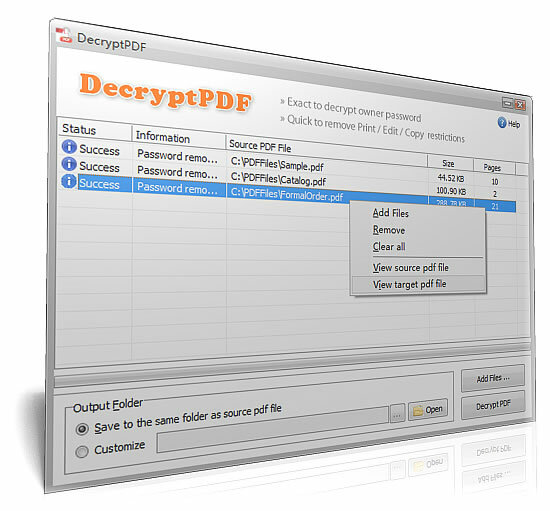 DecryptPDF|PDF Password Remove|Decrypt PDF|PDF Decryption|Quick to Decrypt protected Adobe Acrobat PDF file and Removing restrictions on printing, editing, copying. DecryptPDF does not rely on any other third-party software,Adobe Acrobat and Reader NOT required. Popup a nag window and The first page shows the watermark. The trial version is can only decrypt the first page from your original PDF file.